of the best float cabin living posts from 2015. Black Huckleberry - I participate in a meme called ABC Wednesdays. Since 2014, I've been sharing pictures and information about the plants and animals of Coastal British Columbia. The most popular post was the Black Huckleberry that grows in our high country. The blueberry like fruits are good fresh, canned, in jams, or pies. Yum! Goat Island on the left near the Goat River. 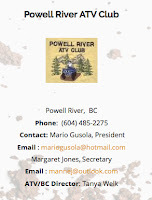 Circumnavigating Goat Island - Our float cabin is on Powell Lake and Goat Island is our front porch view. 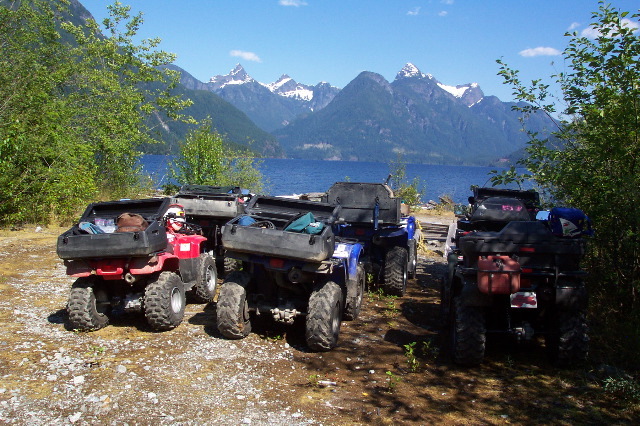 It's a large island with a mountainous interior and lots of logging roads to explore. When ice age glaciers came through, Goat Island's peaks were above the grinding mass. And yes, there are wild mountain goats on the granite cliffs. Our float cabin home at Hole in the Wall. Small Cabin Living - Our float home is 675 square feet on a 40x40 cedar log foundation. We bought it in 2001 from the builder, John. He's now our good friend and mentor for off-the-grid living. In this category my most popular post is always Float Cabins for Sale where I share properties that are for sale, rent, or lease on Powell Lake. Rain bubbles in our natural swimming pool. Mother Nature Blowing Bubbles and Windstorm Waterspouts tied in the weather category. Growing up in Los Angeles, I didn't experience many weather phenomena. Now we have a weather station of our own to measure temperature, wind, rain, sunlight, and lake levels. Logs let us follow year-to-year changes. My upper garden created from compost. From Compost to Garden - I've gardened at the cabin since 2002. 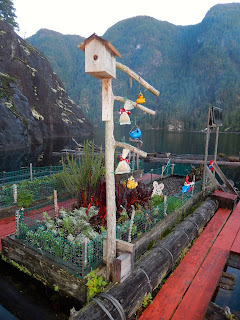 My float garden has raised beds on a cedar log raft. I garden in pots on the deck, especially for potatoes. My cliffside garden is a plot I've created using compost from my kitchen and garden clippings and its watered with a rain barrel collection system. Cabin Cooking: Garden Fresh Salsa - I like to share recipes from the cabin, especially ones that include garden produce, and I've learned lots about canning and preserving. We remodeled our kitchen and upgraded the propane stove and refrigerator in 2012, but I still enjoy simple cooking on my woodstove during winter months. Wayne cleaning the outside chimney pipe. Removing Creosote from a Woodstove Chimney - A woodstove lets us live in our cabin year-round, and a rotating chimney cap keeps the smoke out. Wood floats in for us to cut and store. Our Kozi stove has a glass window. There's nothing better than watching the flames, and soaking up the warmth. Cabin battery bank in its storage box. Voltage, Amps, and Watts - We live off the grid, but still need power. 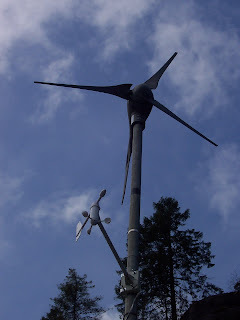 Solar, wind, and even our woodstove give us electricity. A generator helps out during winter. Propane runs our lights, stove, and refrigerator. 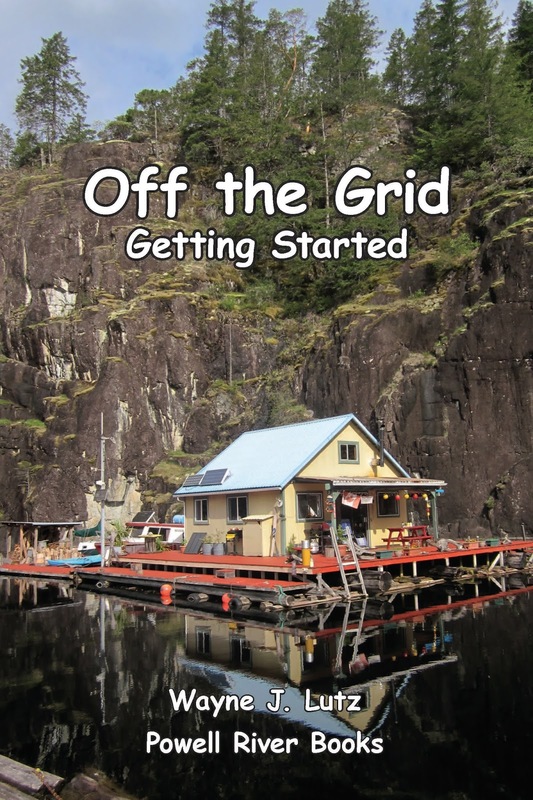 Our off-the-grid lifestyle requires very little power. Battery booster packs and DC lights help on winter nights. Cabin remains in the Olsen Valley. More Treasure Hunting in the Bush - We got a barge to carry our two quads around Powell Lake so we can explore the many logging roads and trails. There are so many things and treasures to discover. 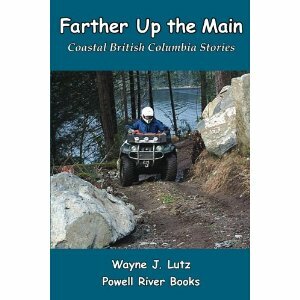 Wayne wrote a book that came out this year about some of our adventures Powell Lake quad entitled Beyond the Main. 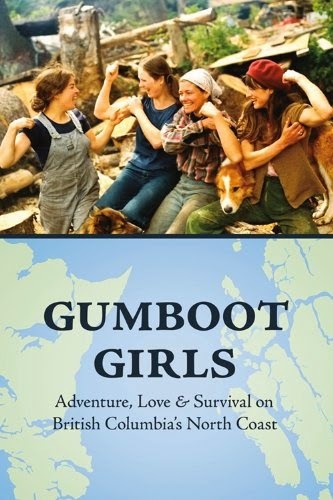 "Gumboot Girls" by Jane Wilde - Living off the grid gives us plenty of time for reading and writing. I like books about our region and people who live off the grid like we do. 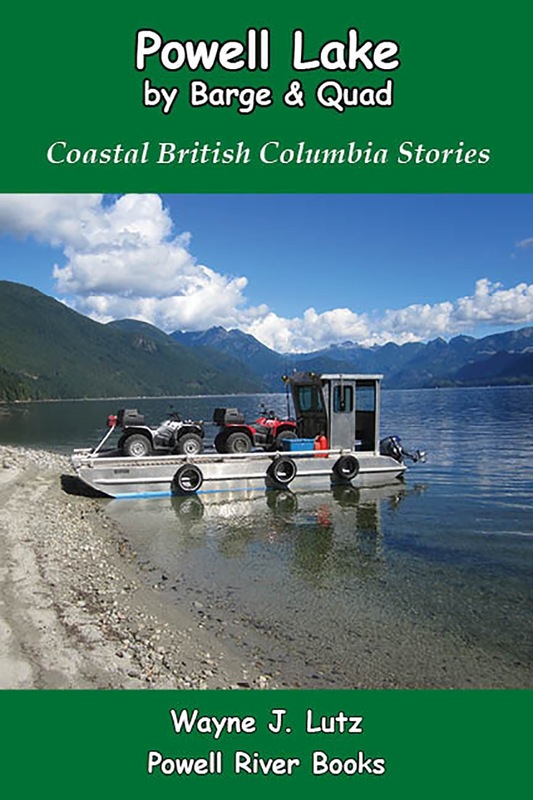 I'll close with a shameless plug for Wayne's Coastal BC Stories series. 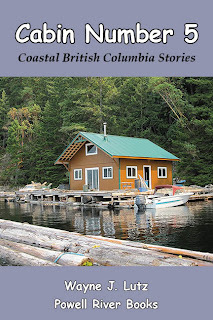 He's written twelve books in the series about our Powell River region and Powell Lake home. Get Up the Lake for free for you Kindle or e-book. It's woodrat (also known as a packrat) season up at the cabin. It's a seasonal thing, but this year they've been quite prolific. I know when there's a woodrat hanging around because they chew up plants on my cabin deck, and they build nests in our storage shed on shore. This time of year there aren't many plants on the deck, but the current batch of woodrats have taken a liking to the cedar tree I've been nurturing for five years. I've wrapped it in plastic mesh and topped it with bird netting, but they still get through to chew off branches. Here's what they do with the cuttings (and lots more from the nearby cliff). I get frustrated. So far, this is woodrat number six in the last two weeks. How they all know about the cedar tree is a mystery. But it's hard to get too mad at such cute little guys. They have rat in their name, but don't look like their city cousins. Here's Wayne saying good-bye to our most recent holiday "guest" and preparing to take her (I've read woodrats have a matriarchal society) on a cruise to a new home on Goat Island. Even in stormy moods, Mother Natures makes Powell Lake a work of art. A photographic work of art that is. I found a dying bug on the picnic table outdoors and didn’t think much about it. Then I found another that looked just the same inside the cabin climbing up the kitchen window. He was too high up for me to reach, but the next morning there he was sitting in the sink. I took him out on a paper towel and deposited him on the front deck to photograph. Here’s what I discovered. Based on the photographs in Insects of the Pacific Northwest, he appears to be a Western Conifer Seed Bug. The information indicates that they are rare to see because they spend their lives living up at the top of confer trees feeding on the seeds in pinecones. The Western Conifer Seed Bug (Leptoglossus occidentalis) is a member of the Squash Bug family (family Coreidae). They are brown with yellow or white wings. My specimen opened his wings while I carried him outdoors and they were white with darker lines through them. The tibia of the hind legs are flattened and leaf-like. The body is medium sized at 17 millimetres. Reference: Insects of the Pacific Northwest (Timber Press Field Guide, 2006) by Peter Haggard and Judy Haggard, and PennState College of Agricultural Sciences Department of Entomology "Insect Advice from Extension: Fact Sheet" (online). Suet balls for the birds. Melt the lard and peanut butter and then stir in the other ingredients. When it is all mixed you can put it into containers that you purchase bird suet in, or you can roll it into balls for putting into mesh bags. Extras can be frozen until needed. I'm not very good about following recipes, even for human meals. Here are the changes I made and it worked out okay. I cut the corn meal amount to 1 cup and substituted 1 cup of birdseed. I cut the oatmeal amount to 1 cup and substituted 1 cup of sunflower seeds. A completed bird seed feeder. It made six balls I could use as both bird feeders and Christmas decorations around the cabin. I used bags I'd saved from my onion sets. They were a perfect size. I used a short dowel at the bottom of each bag to make a built-in perch for birds to use as a part of their dining experience. Hanging suet feeder on our bridge to shore. Now all I need is some better weather to see if any birds are left in the vicinity to enjoy their special treats. Hanging feeders on our birdhouse tree. Solar panels and a wind generator on the left. My last job was in technology for a school district. But, I have to be honest, electricity has always baffled me. Fortunately Wayne, a physics major, has a better grasp. We live off the grid and have to maintain an electrical system with storage batteries that allow us to use electric devices. Our electrical closet, the heart of our system. What is electricity? Sparkfun defines it as the flow of electric charge. Current electricity moves. That's the kind we use when something is plugged in. Static electricity is stored energy, like in our batteries. 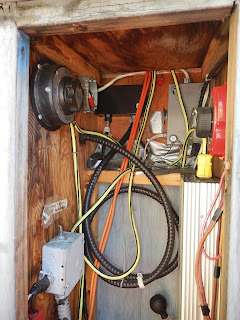 Our system starts with electricity generated by the sun, wind, woodstove heat, and a backup gas generator. Then it flows as a current to our batteries, is stored, and available for us to use. How do you measure electricity? That's where voltage, amps, and watts come in. Voltage, measured in volts, is the force that makes electricity move through a wire. Our battery banks are connected in a 12-volt configuration. 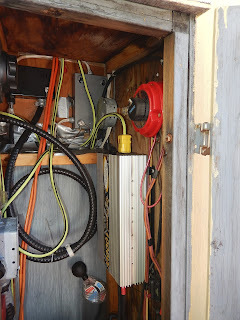 The inverter is the silver box on the right. An inverter changes the DC (direct current from our off-the-grid sources) to AC (alternating current) and boosts the voltage to 110 so we can use small appliances. The current is the flow of electrons through the wire and is measured in amperes (amps). Voltage and current give you electrical power (which is measured in watts). All of these are terms I've heard, but didn't need to understand until we started making our own electrical power. The black switch changes from cabin to boat. That enough of the technical stuff. Here's our system. It's grown over time, starting with one solar panel and two storage batteries in 2001. It's increased to two solar panels, a wind generator, a woodstove thermoelectric generator, and six batteries. In 2006, we added a separate system in Wayne's writer's retreat boat (the Gemini) with one solar panel and six batteries. A switch in our electrical panel allows us to use one system while the other recharges. Last summer we decided to replace our batteries. After lots of research, Wayne decided to stick with 6-volt golf cart style deep cycle batteries connected together in a series of two to make a 12-volt system. Each pair is then connected in parallel to remain at 12-volts, but increase the storage capacity. The Gemini with her solar panel on top. Golf cart batteries last about ten years. We've had to replace a few, but our cabin system lasted fourteen years and the Gemini system lasted nine. Of course, we asked our good friend John (who built our cabin in the first place) to help us. He returned the worst batteries for a refund, but kept ten to use at his cabin. Waste not, want not. John installing new batteries to the Gemini system. We replaced all of the batteries at once because they were close to end-of-life, and it takes only one marginal battery to make a system less efficient. With winter and less solar input on the way, we wanted optimal storage capacity and output. So far, so good. We haven't had to use the backup generator yet. The cabin battery bank in its brand new storage box. The last stop is Olsen's Landing on Powell Lake. The logging dock is still in use, but you can see from all the growth on it's massive cedar logs that it's a piece of history too. 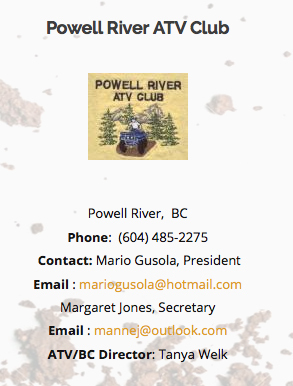 If you want to know more about exploring the Powell River backcountry, contact the Powell River ATV Club on Facebook, phone or email. 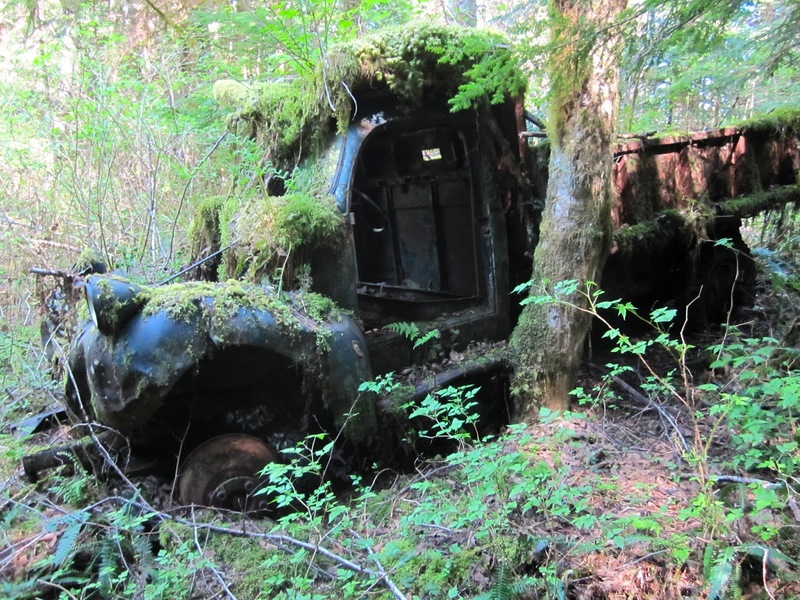 Help from locals may be needed for you to find some of these off-road treasures. In my last review, I mentioned how I like to read multiple books by authors I enjoy. One of those authors is Chris Czajkowski. Here's a list of her books in the order they were written. The ones with stars (*) I've already read. Chris was born in England. After travelling the world, she settled in Canada. Chris was never a "city girl," so she headed to Salmon Arm in British Columbia to work on a dairy farm. 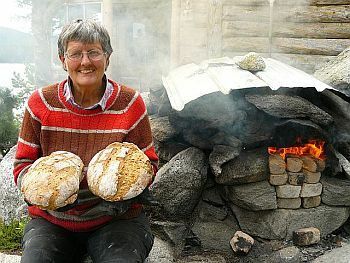 She was asked to deliver a piece of farm equipment to Trudy and Jack Turner in the Chilcotin wilderness. Trudy is the daughter of Ralph Edwards, an early homesteader at remote Lonesome Lake. 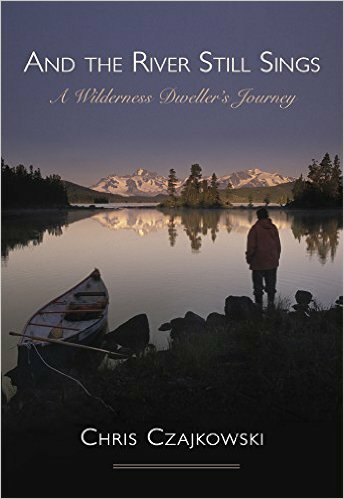 His life was chronicled in Crusoe of Lonesome Lake. Trudy's life on her own homestead became the story behind Fogswamp: Living with Swans in the Wilderness. 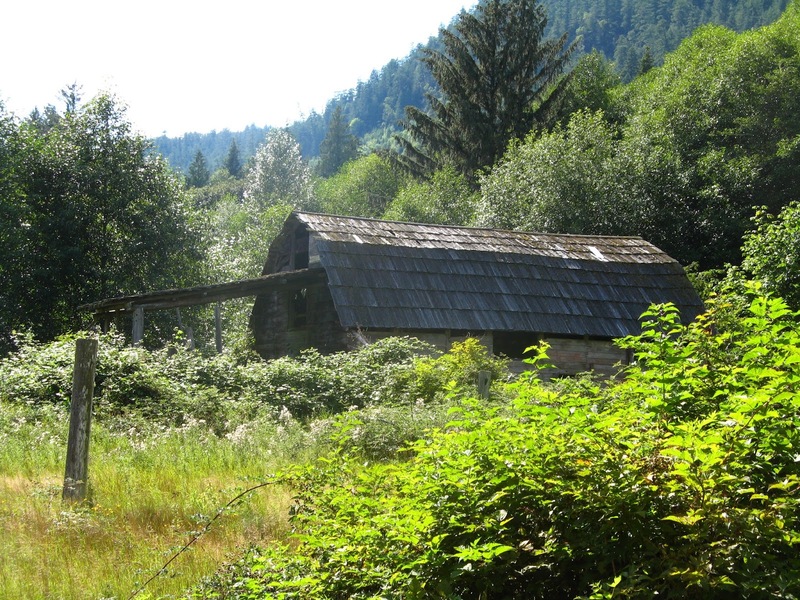 Chris fell in love with the remote wilderness, and was allowed to build her first cabin on the Turner's land. When it came time for them to sell, Chris headed farther into the wilderness to find a place where she could start a place of her own. The result was Nuk Tessli, a wilderness resort that she built from the ground up. And the River Still Sings, her newest book, follows Chris's life from England, around the world, into Canada, through her Nuk Tessli experience, and up to the present at her homestead property on Ginty Creek. I enjoyed reading this book because it tied all the previous books together. It included now experiences and perspectives, so it gave a fresh look to older stories. Chris's books can be read in any order, but if you haven't read any, you might want to start with some of the older titles and save And the River Still Sings for later. If you can read only one, this is it. An old growth forest includes large living trees, standing dead trees or snags, and fallen logs in various stages of decay. Beneath the tall forest canopy you will find what is called the understory. The carbon-rich soil from decayed leaves, needles, and logs provides fertile ground for mosses, fungi, lichens, and other shade lovers. Bracken Fern in the understory. The understory also serves as a nursery for tree seedlings. Here, you will find "nurse logs" that help regenerate forest. Frequent precipitation and humidity in BC's coastal rainforest adds to the profusion of plant and animal life in the understory. Salal leaves are used by florists and the berries can be eaten. These pictures were taken during a hike through a second growth forest near our cabin on Powell Lake. duff. Forest litter and other organic debris in various stages of decomposition on top of the mineral soil; typical of coniferous forests in cool climates, where rate of decomposition is slow and where litter accumulation exceeds decay. Stump acting as a "nurse log." On our hike, I let Wayne go ahead so I could be alone and surrounded in the forest's peace and tranquility.